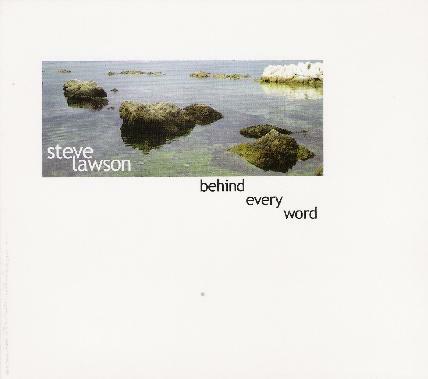 Steve Lawson - "Behind Every Word"
Steve Lawson is a bassist from England who uses real time looping, recording in real time and then playing over the top, usually all improvised, and has released several solo and duo albums. Behind Every Word is Steve's fourth solo album, which according to the press sheet "combines the ambient improvs of his previous work with more structurally composed music and a greater emphasis on melody". Indeed, right from the first track it's clear that this album will be a bit different. "Blue Planet" opens with an actual "normal" bass melody, indicating that we're in more song oriented territory than most of Steve's work. What hasn't changed of course is that this is bass-centric music, and the instrument handles rhythm, guiding melody, spacey ambience and even a cool grooving keyboard sound. Full band bass! "Behind Every Word" starts off as an easy paced light jazz tune, but is soon abducted by aliens, who envelop it in spaced out looped ambient waves. Excellent morphing job on this one. Really took me by surprise. Ditto for "This House Is A Happy Home", which lulls the listener with a bass driven melodic song, until floating space atmospherics descend from above, singing, howling and hovering around the central bass theme. Very cool. Other highlights include "Me, Myself and I", which has a great space funk groove that dances around the more meditative space ambient and light jazz elements, as well as some very cool whining guitar sounding parts. Lots happening on this one. And that's the pattern throughout much of the album… lullaby melodies shrouded in space ambience. Steve excels at getting mucho freaky with the alien activity, without drawing too sharp a contrast with the song oriented nature of the music. The risk is great but he pulls it all together skillfully. There are also two guests on the album that deserve mention. "Scott Peck" includes pedal steel guitar contributions from BJ Cole. And jazz singer Julie McKee adds vocals to the 15 minute "One Step". This track has some of the spaciest music and efx on the album, but add to it smokey lounge female jazz and torch song vocals. I don't know how to adequately describe it, but Steve has taken space ambience and electronica to a realm I've not heard before, all with bass and loops. In summary, I've heard quite a bit of Steve's music over the past 6 years and found Behind Every Word to be a fresh and thoroughly enjoyable change of pace. Steve beautifully and creatively combines the space ambient elements that characterize much of his music with a more composed song oriented nature. I can imagine this album appealing to ambient fans who crave more variety and melody in the genre, jazz fans who aren't afraid to trip out in space a bit, assorted prog fans and anyone thirsting for something outside the box. Oh yeah, and bass aficionados who want to hear the incredible possibilities of the instrument will be bowled over, guaranteed. For more information you can visit the Steve Lawson web site at: http://www.stevelawson.net. Hear Steve Lawson at his Myspace site at: http://www.myspace.com/solobassstevelawson. Visit the Pillow Mountain Records web site at: http://www.pillowmountainrecords.co.uk.